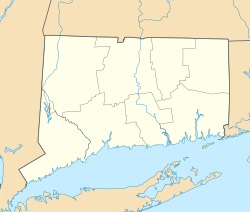 New Milford is a town in Litchfield County, Connecticut, United States, located in Western Connecticut. The town is located 14 miles (23 km) north of Danbury, on the banks of the Housatonic River. It is the largest town in the state in terms of land area at nearly 62 square miles (161 km2). The population was 28,142 according to the 2010 Census. The town center is also listed as a census-designated place (CDP). The northern portion of the town is situated in the region considered Northwestern CT and the far eastern portions are part of the Litchfield Hills region. The Weantinock were a sub-group of the Paugussett Nation, who lived the area of modern New Milford both before and during the colonial era. They had a farming and fishing culture, cultivating corn, squash, beans and tobacco, and fishing in freshwater areas. They may have also travelled to the coast to fish during the summer months. They spoke an Algonquian language. On October 17, 1711, twelve families (including a total about 70 people) petitioned the General Assembly to create the town, together with the associated privilege of levying a tax to support a minister. With the legislature's approval, the town was organized the next year. The residents soon secured Daniel Boardman to preach and he was ordained as the minister of the Congregational Church on November 21, 1716. In 1931 Housatonic Valley Insurance Agency was established, and became one of the founding members of the New Milford Chamber of Commerce later that year. Today Housatonic Valley Insurance Agency is still located on the New Milford Green in the charming historic white colonial house built in 1795, directly next door to Town Hall. The town has constructed a 1,000,000-gallon sewer plant expansion on West Street, a sewer pump station on Boardman Road, reconstruction of the Rte. 67/ Grove Street Intersection, and ambulance facility on Scovill Street. The town has added a skate park at Young's Field (2006), reconstructed the tennis and basketball courts at Young's Field (2010), reconstructed the basketball court at Williamson Park in Gaylordsville (2010), and improved Lynn Deming Park (2017), and is working on the New Milford River Trail, which will eventually join the existing 1.5-mile Sega Meadows Park trail (2012), 3.5 miles of River Road, and the 0.25-mile Young's Field River Trail (2017) and link them to the greenways in the neighboring towns of Brookfield and Kent. Several streetscape projects were completed by the Department of Public Works (DPW) with grant money on Church Street, Whittlesey Avenue, and the west side of East Street (2009/2010). Candlewoof Dog Park is completed on Pickett District Road. A bocce ball court was constructed at the Senior Center by Boy Scout Troop 66 (2012). New Milford has a humid continental climate, with mild to warm humid summers and cold to very cold winters. The highest recorded temperature was 103 °F (39 °C) in July 1966, while the lowest recorded temperature was -15 °F (-26 °C) in 1968. Snowfall is generally frequent in winter while average precipitation is most common in September. As of the census of 2010, there were 28,142 people, 10,618 households, and 7,503 families residing in the town. The population density was 456.9 people per square mile (176.4/km²). There were 11,731 housing units at an average density of 190.4 per square mile (73.5/km²). The racial makeup of the town was 91.71% White, 1.72% Black or African American, 0.24% Native American, 2.77% Asian, 0.04% Pacific Islander, 1.65% from other races, and 1.87% from two or more races. Hispanic or Latino of any race was 6.02% of the population. Of the 10,618 households 33.4% had children under the age of 18 living with them, 58.0% were married couples living together, 8.8% had a female householder with no husband present, and 29.3% were non-families. 23.0% of all households were made up of individuals and 7.9% had someone living alone who was 65 years of age or older. The average household size was 2.62 and the average family size was 3.13. In the town, the population had 24.30% under the age of 18, 6.87% from 18 to 24, 24.90% from 25 to 44, 31.75% from 45 to 64, and 12.18% who were 65 years of age or older. The median age was 41.4 years. For every 100 females, there were 97.4 males. For every 100 females age 18 and over, there were 93.6 males. As of the 2000 Census the median income for a household in the town was $65,354, and the median income for a family was $75,775. Males had a median income of $50,523 versus $34,089 for females. The per capita income for the town was $29,630. About 2.1% of families and 3.3% of the population were below the poverty line, including 2.7% of those under age 18 and 5.5% of those age 65 or over. In the CDP the population was spread out with 24.4% under the age of 18, 8.2% from 18 to 24, 35.9% from 25 to 44, 20.3% from 45 to 64, and 11.2% who were 65 years of age or older. The median age was 35 years. For every 100 females, there were 93.8 males. For every 100 females age 18 and over, there were 88.5 males. New Milford is served by fixed-bus routes of the Housatonic Area Regional Transit. The main highways of the town are Route 7 and Route 202. There has been continued talk about a proposal to electrify and extend the Danbury Branch of the Metro-North Railroad north of Danbury to New Milford, including a Rail Study in 2008  and proposed state legislation in 2017. ^ "Town of New Milford Connecticut". New Milford, Connecticut. Retrieved September 22, 2012. ^ "Mayor". Town of New Milford, Connecticut. Retrieved August 13, 2017. ^ "Town Council Members". Town of New Milford, Connecticut. Retrieved August 13, 2017. ^ "New Milford town, Litchfield County, Connecticut". American Fact Finder. US Census Bureau. Retrieved 28 December 2018. ^ Charles W. Brilvitch (2007). A History of Connecticut's Golden Hill Paugussett Tribe. The History Press. pp. 13–14. ISBN 978-1-59629-296-3. ^ "Average weather for New Milford, CT". weather.com. Retrieved February 1, 2014. ^ "Population of Connecticut Towns 1756-1820". State of Connecticut. June 3, 2008. ^ "ACS DEMOGRAPHIC AND HOUSING ESTIMATES". American Fact Finder. US Census Bureau. Retrieved 28 December 2018. ^ "Profile of General Population and Housing Characteristics: 2010". American Fact Finder. US Census Bureau. Retrieved 30 December 2018. ^ "New Milford Town Web Site 12/27/2007: Rail Study". Retrieved 2008-03-04. ^ "New bill would require passenger rail to New Milford 01/10/2017". Retrieved 2017-10-01. ^ Catlin, Roger (2001-02-01). "Vertical Horizon Reaches For Stars: From Acoustic To Metal, Band Finally Hits It Big". Hartford Courant. Retrieved 2011-07-17. ^ "Famous alumni of the Canterbury School". NewsTimes. Retrieved 2018-04-22. 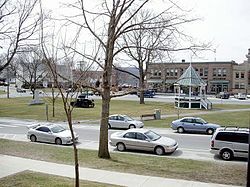 Wikimedia Commons has media related to New Milford, Connecticut. "New Milford" . New International Encyclopedia. 1905. "New Milford" . The American Cyclopædia. 1879.